Paul McCartney has revealed that his upcoming performance at the Liverpool Echo Arena is to be a very special, one-off celebration of The Beatles’ career. In an exciting, once in a lifetime performance, the show is to feature numerous special guests and will be filmed for DVD and Blu-Ray release, along with live screenings of the event across the world. Announcing the concept on BBC 6Music this morning, Macca stated; “the idea started when I realised it was the 50th anniversary of Yesterday. It struck me that we’ve never truly celebrated what we did in our hometown, and it seems to mean a lot to enough people for us to do something. “So, I called Ringo up and asked if he’d be willing to come along and play on a couple of tunes, and he seemed game. But then we thought, why stop here? Let’s invite some friends along too. Other special guests appearing with McCartney and Starr (who Macca is inducting into the Rock & Roll Hall of Fame later this month) include David Gilmour, Ronnie Wood, Dave Grohl, Noel Gallagher and Liverpool stars such as Kerry Katona and Barry Wom. But through it all lies the spectres of John Lennon and George Harrison. “Initially, we were going to have Julian [Lennon] and Dhani [Harrison] join us to commemorate their fathers’ contributions,” Starr said. “But we thought it would be much less contentious to get holograms of them instead. If 2Pac and Michael Jackson can have holograms, so can our guys, you know? 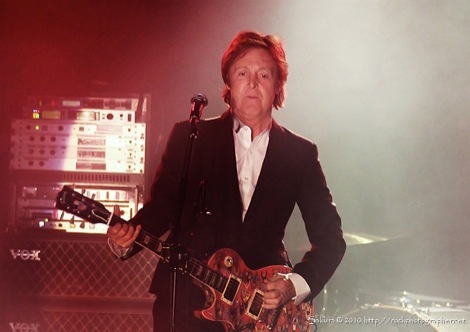 “Yoko has expressed some interest in performing,” McCartney clarified. Also slated to appear is Stevie Wonder, who is expected to perform both We Can Work It Out and to join Macca for Ebony and Ivory, recently voted the single most fondly remembered song in history. And what Beatles tribute would be complete without Bob Carolgees and Spit the Dog? The duo will open the show with a unique take on Yesterday to celebrate the song’s Golden Jubilee. OK…this is getting stupid. You must have figured out that this is an April Fool by now?